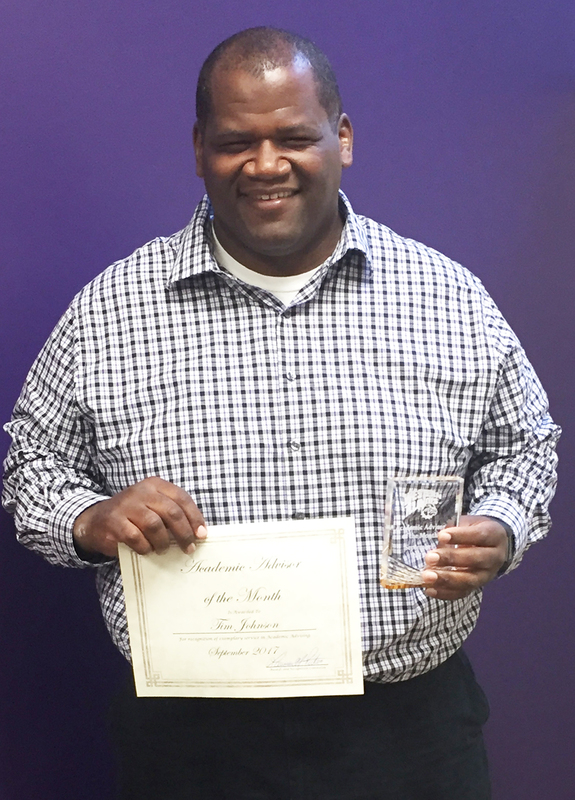 MACOMB, IL – Western Illinois University Academic Advisor Tim Johnson has been named the Advisor of the Month for September. Johnson was nominated by two students he advises. "School has never been easy for me, including things such as keeping myself focused on school work and going above any beyond in my work," said one student. "Tim helped keep me on track, such as keeping on me about my upcoming assignments, quizzes and tests, asking what I was doing to help me get those done and how I was studying for them. Tim made sure I was also keeping an eye on my work and was pushing myself positively." The second student nomination came from a graduate assistant who was assigned to Johnson when his supervisor retired. "Although I have worked directly with him for a little over a month, I have already seen his enthusiasm for academic advising and the success of the students at Western Illinois University," the student said in the nomination. "Tim has worked tirelessly throughout September to ensure the rest of the semester and the academic year are set up for success." Each month a WIU advisor will be honored with a certificate and trophy. Award winners are decided by a committee that considers the applications each month. For more information about the advising services at Western, visit wiu.edu/advising.